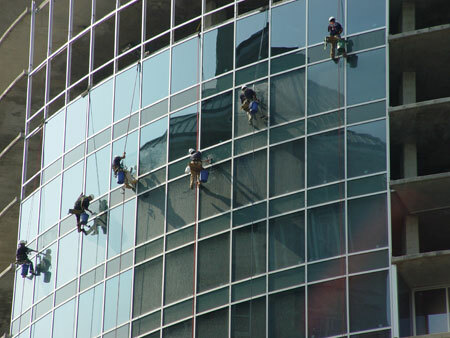 We strive to meet and exceed commercial post construction window washing expectations through a dedication to safety. We only perform post construction window washing services that meet OSHA and ANSI guidelines. In reality, the post construction cleaning business contains inherent dangers associated with performing work in a construction environment. Our post construction window washers are trained with a safety first mentality. While many post construction cleaning companies claim to function with a safety first mentality, we consistently monitor our projects to ensure that our post constructionwindow washers are practicing safety. Cleaning glass windows is just one of the functions of our window washers. Accessing the windows safely enables us to perform construction clean up for years to come.